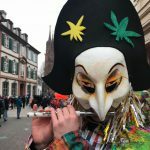 All those weird masks (and the people behind them) that are so much a part of Basel’s annual Fasnacht festival have a new reason for their crazy grins. The annual 3-day festival was just added to the UNESCO list of events exhibiting the “Intangible Cultural Heritage of Humanity”. With this list, UNESCO “seeks to protect a heritage that does not fit in with stone and space, but with time, community practices and social interactions”, says a statement released by the Swiss federal government. Amid the colourful cacophony of traditional music, dance, food and crafts, one feature of the festival that impressed the UNESCO committee was the role that language plays. Throughout the festival satirical poems and songs are delivered in the local Basel dialect on the streets and in cafés. The committee also noted how the festival encourages youth participation in its imaginatively costumed fife and drum groups. Fasnacht, which draws about 200,000 visitors each year, is only the second Swiss cultural festival to be named to UNESCO’s list. 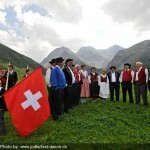 The first was the Winegrowers’ Festival in Vevey. The next Fasnacht fills the streets of Basel Feb. 19 – 21, 2018.